Pumpkin seeds are a tri-doshic gem, even Kaphas can have them! Kaphas have few choices when it comes to nuts and seeds because of their high fat content. But as I was making this pumpkin seed butter I could see why it would be Kapha-friendly; when you toast the seeds you can see that inside are air pockets (which when heated makes some of them pop!) and a bowl full of these seeds is light and airy -- and Kaphas need foods that have Vata (air) qualities for balance. Use this butter on toast, biscuits, pancakes, or in cookie recipes or salad dressings! 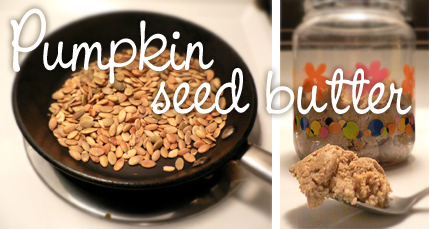 Lightly toast the pumpkin seeds until they get a warm golden hue. I like to swish them around in a dry pan over medium heat for 5 to 10 minutes. Let cool. You can use a food processor or wand-style hand blender to make the butter. Either way, place the cooled seeds in the container and begin by grinding to a fine powder. Then and add oil, maple syrup, allspice and salt. Blend and puree until you get a smooth butter (takes 5 to 10 minutes of processing). The longer you process it, the smoother it will become. Yum, this sounds divine! As far as using the butter *in* cookie recipes, would you just substitute it for another nut-butter in a recipe, or would it be used some other way? It was hard not to eat the whole jar by the spoonful! You can substitute this pumpkin seed butter for other kinds of nut butter, like in peanut butter or almond butter cookies. As you can see, we’ve linked to your site in an effort to connect our customers with useful information about the Pumpkin Seeds they love, and we’re hoping you’ll be willing to return the favor by linking back to our Pumpkin Seeds product page. :) If you do a web search you’ll see NutsOnline consistently has low prices and very favorable customer satisfaction. We’d be eternally grateful if you could place a link to: http://www.nutsonline.com/snacks/pumpkinseeds/ within the text "Pumpkin Seeds" on your site, so that if people are interested in buying Pumpkin Seeds, they’ll know exactly where to go! What is the shelf life? It sounds good. It's very tasty but very thick! I don't know the shelf life exactly but if you refrigerate it I think it should last 3 months or maybe up to 6 months. Oh My! I found a large bag of pumpkin seeds in the cupboard yesterday and have just made the pumpkin seed butter... it's gorgeous! How on earth am I supposed to stop eating it?